It’s a classic. ~ Stop in tonight from 5-7pm during downtown Gloucester’s “Customer Appreciation Night” 10% off all retail items to create the perfect gift! saltwatermassagestudio~~ Now Hiring ~~ Join a team of 7 dedicated massage therapists. | Equitable Compensation Structure | Discounts on Services and Products | Realistic Work/Life Balance Expectations | Happy, Healthy, Supportive Work Environment ~~ To apply, send resume to gretchen@saltwatermassage.com including availability. 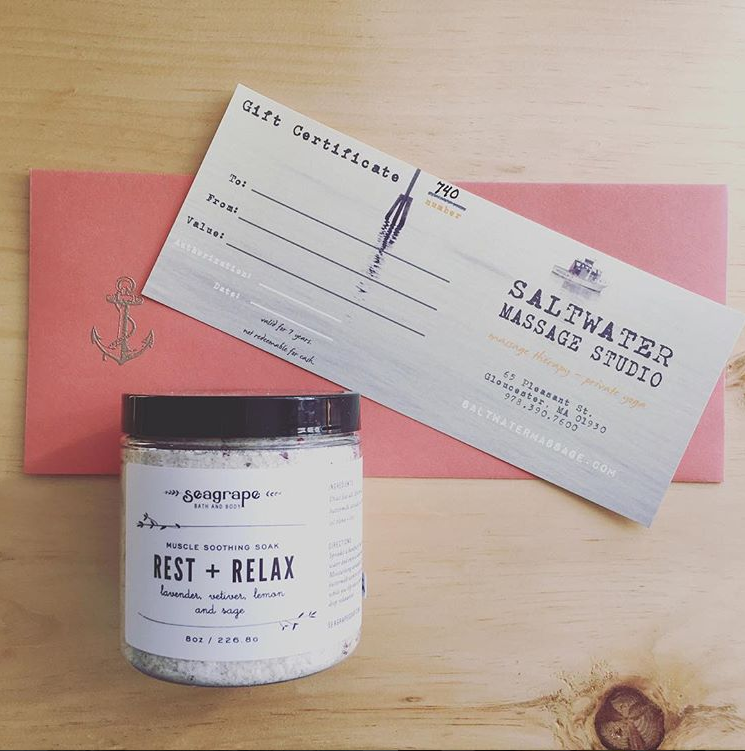 saltwatermassagestudio~ TONIGHT ~ 10% off all retail and gift certificates at our Self-Care Soirée!! 5:30-8. See you there. On Tuesday, November 7th, 5:30 – 8pm we’ll be warming up the studio with a belated post-expansion toast? pre-holiday mixer? post-summer grief support group? Who cares what the occassion is… Let’s call it Self-Care Soirée! All evening long, the Saltwater Massage Team will be serving up mini massage treatments and Valerie from Nature’s Body Art & Soulstice Shop in Rockport, MA will be hand-painting her beautiful henna tattoos!! And of course, sweet treats and sparkly drinks will be served. come see our collection small batch skincare, organic bath & body, handmade jewelry, soy candles, clothing and other happiness inducing products!